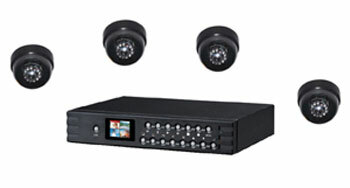 This cctv package is ideal for the home or a small shop or office, it includes 4 high resolution CCD dome cameras with infrared night vision as well as a DVR with integrated LCD screen fitted with a 160GB hard drive. Everything required to get up and running with your first surveillance system is included. Support USB port for connecting PC for monitoring and backup, no need to remove the hard disk.